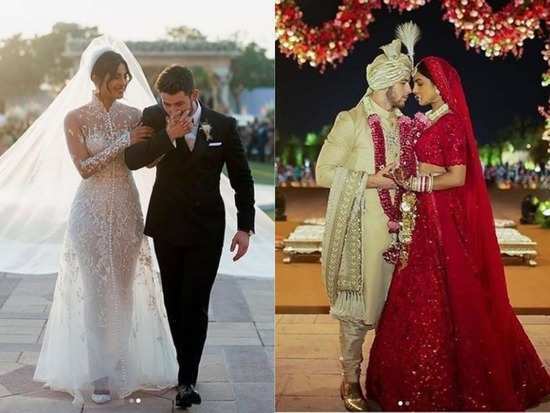 HomeFashionThe first pictures from Nick Jonas and Priyanka Chopra's wedding are now out! Priyanka Chopra and Nick Jonas' very first pictures from their wedding ceremonies are finally out and they're breaking the Internet. The duo looks phenomenal in their wedding attires and we must say they've added a certain charm to weddings with their Hindu wedding and their Christian wedding looks. The couple got married on Saturday in a Christian wedding and on the next day they tied the knot once again in a traditional Hindu wedding. For the Christian ceremony, Priyanka opted for a Ralph Lauren custom-made dress which was hand beaded and hand embroidered. It also featured floral and scroll motifs, lace-effect tulle appliques, scalloped sleeves and a high neck collar. Her look was completed with a 75-foot tulle veil which we've fallen head over heels in love with. Accompanying her was Nick, looking absolutely dashing in a Ralph Lauren tuxedo. For the Hindu wedding ceremony, Priyanka opted for a gorgeous lehenga by Sabyasachi Mukherjee which featured French embroidery. The red lehenga was teamed with a matching choli and a red dupatta to round out her look. Nick was seen in a golden sherwani complete with a turban and golden shoes. The couple is all set have their reception in Delhi on December 4. And we for one can't wait to see what they wear to their reception. Stay tuned for more updates. 1The first pictures from Nick Jonas and Priyanka Chopra's wedding are now out! 6Kareena Kapoor Khan or Sara Ali Khan: Who wore Raw Mango better? 7Isha Ambani is the quintessential Sabyasachi bride! 9Alia Bhatt’s dress is the date-night look you were searching all over for! 10Who wore the Sabyasachi ensemble better: Deepika Padukone or Kangana Ranaut?